Emily Catherine Fedorko Foundation and The Greenwich Point Conservancy are pleased to announce the Foundation’s pledge to the Greenwich Point Conservancy of financial and planning support for the restoration of the historic Chimes Tower, which is a part of the beautiful and historic “Chimes Building” (c. 1896) at Greenwich Point. The pledge will include funding for the restoration of the Chimes Tower, which was added to the Chimes Building by J. Kennedy Tod in 1901. The restoration of the Chimes Tower will include refurbishing the rare c1901 “Chimes” mechanism and bells, which are located in upper portion of the Chimes Tower, and creating a water safety center in the base of the Tower. The overall restoration project for the Chimes Building, including the Chimes Tower, is being led by the Greenwich Point Conservancy, in coordination with the Town of Greenwich. The project is slated to commence following completion of the overall facility design, and receipt of all necessary Town approvals. 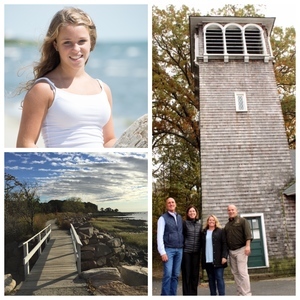 The pledge and restoration work on the Chimes Tower is dedicated to the life and memory of Emily Fedorko, a 16-year old Greenwich High School student who lost her life in 2014 during a tragic water tubing accident off the coast of Greenwich Point. Following the restoration of the historic Chimes Tower, the musical mechanism and bells system in the Tower will be known as “Emily’s Chimes”. Further, the creation of a water safety center at the base of the Chimes Tower will further the Foundation’s mission to spread education, advocacy, and awareness of boating and water sports safety regulations and practices for adults and children. The Emily Catherine Fedorko Foundation (ECFF) is a family foundation that provides funding to spread education, advocacy and awareness of boating and water sports safety for adults and children, throughout Connecticut and nationwide. The foundation was created by Pamela and Joseph Fedorko to honor the life of their beautiful 16-year old daughter Emily, who lost her life during a tragic water tubing accident in the summer of 2014. ECFF supports programs and initiatives that educate boaters and water sports enthusiasts of all ages about the importance of understanding and following essential boating and water safety laws, regulations and best practices. This includes awareness of both state and local boating and water sports rules and regulations, attaining necessary certifications, knowledge of each body of water, the vessel mechanics, and life jacket requirements, ongoing safety education for boat drivers, navigators and passengers, and more. For more information, or to make a tax-deductible donation, please visit www.emsway.org. The Greenwich Point Conservancy was founded in 2004, and its mission is to work for the restoration and preservation of the historic structures and other elements at Greenwich Point for the enjoyment of current and future generations. Over the past fifteen years the GPC has funded and directed the restoration of the historic and award-winning Innis Arden Cottage (c1903) and creation there of the Floren Family Environmental Center at the Innis Arden Cottage, the restoration of the oldest building at Greenwich Point, The Old Barn (c1887), and the creation of the Sue H. Baker Pavilion at the Old Barn, and the restoration of the historic Gateway to Greenwich Point, and the creation of the Gateway Gardens at the entrance to Greenwich Point . Most recently, the GPC funded and directed the restoration of the oldest house in Greenwich, the historic Feake-Ferris House (c1645-1689), which is located just outside the entrance to Greenwich Point and was built shortly after the founding of Greenwich in 1640. At that time, Greenwich Point was known as “Elizabeth’s Neck”, and was the original purchase of Elizabeth Winthrop Feake, the subject of Anya Seton’s famous novel The Winthrop Woman, who with her husband built the original portions of the Feake-Ferris House. The GPC is excited that its next project will be the restoration of the historic Chimes Building (c1896), including the historic Chimes Tower (c1901). For more information, or to make a tax-deductible donation, please visit www.greenwichpoint.org.